JTE: What do you want to eat? JTE: Where do you want to go? 2. Write up target on the board, and ask students what it means. Provide answer if necessary. 4. Once you are sure the students have it down, pass out the Battleship worksheet and have the JTE explain it to save time. I chose to let the students have 4 ships that are one cell big. You can change the rules according to your needs and preferences. 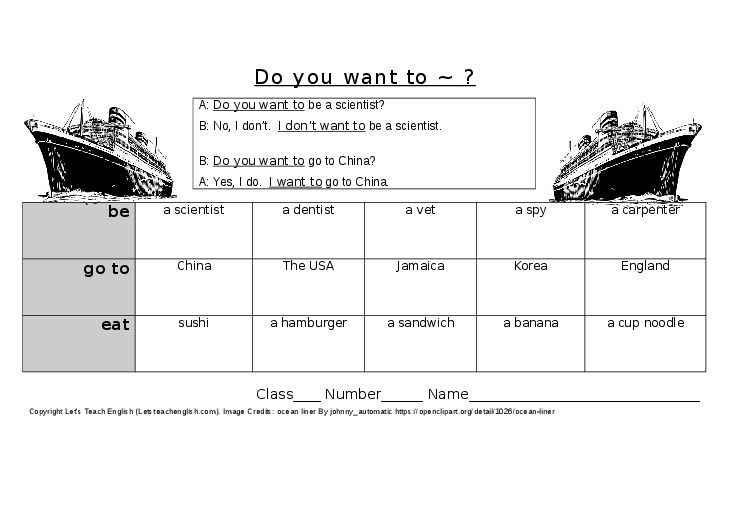 Students try to hit each other's ships by making a "do you want to (row) (cell)" sentence. 5. Once students finish playing, have them write "I want to" sentences, using the locations of their own ships. Vary the cell contents on the worksheet, and rules to your liking. Class was a little short sometimes. Some students move very quickly, while some are very slow. You may wish to be very explicit about the model sentences "do you want to" and "I want to." Sometimes students were confused and didn't know exactly what sort of sentence they were supposed to be writing at the end of the lesson.